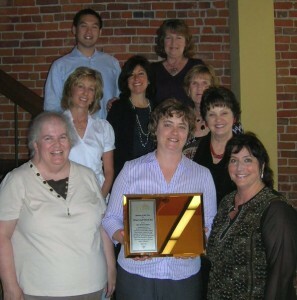 Sun Street Centers announced their Business of the Year recipient for 2011. Ottone Leach Olsen & Ray LLP was acknowledged yesterday at their law offices in Salinas for over 15 years of personal and professional support and volunteerism to the Board and programs of Sun Street Centers, The Road to Recovery. The firm has performed thousands of hours of pro bono legal work for Sun Street Centers including contracts, leases, non profit governance and labor and employment law matters. Partner Anne Leach received the award presented by Sun Street Centers’ CEO, Anna Foglia. Ms Foglia stated that “Anne Leach and the entire firm have made a difference in the lives of families in the Salinas Valley struggling with issues of addiction”. Sun Street Centers has been serving Monterey County for 43 years with Prevention, Education, Treatment and Recovery from substance abuse.